It’s easy to fall in love with Jaipur, the capital city of Rajasthan. Dotted with forts, palaces, temples, museums, and lakes, the city paints a picture of incredible beauty. However, these city highlights are not the only attractions to explore on your trip to Jaipur. Just venture out to the outskirts of the city and you will find places rich in architectural splendor, each of which will bring you closer to the grandeur of Rajasthan in more ways than one. Add to that the hotels in Jaipur that offer you a taste of hospitality Rajasthan is known for, you are all set for a grand holiday. Let’s get started, shall we? 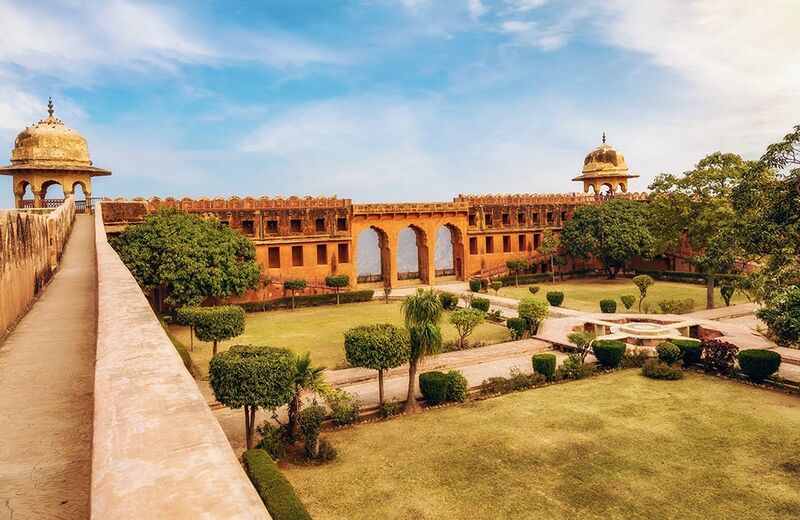 Here’s a list of some of the tourist-worthy places near Jaipur within 50 km that you can add to your itinerary. Set against the backdrop of lush green hills, Gatore Ki Chhatriyan is a complex comprising of several tombs and temples. 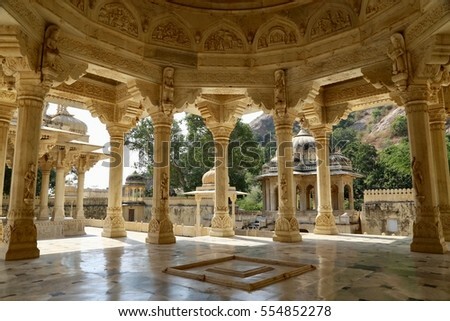 The complex once served as the royal crematorium for the Rajput rulers of Rajasthan. The place attracts travelers and history buffs on account of the majestic cenotaphs built for each famous ruler who was cremated here. These cenotaphs display exceptional Rajasthani carvings that lend the place a distinct beauty. Shaped like umbrellas, these cenotaphs are the reason why the place is called Gatore Ki Chhatriyan. Dedicated to Lord Ganesha, the Garh Ganesh Temple is an age-old shrine overlooking the city of Jaipur. It was built atop the Aravalli Hills by Maharaja Sawai Jai Singh I even before the foundation stone of city was laid by him. Unlike other Ganesha temples across the country, Lord Ganesha is worshipped here as a small boy without any trunk. In fact, the Garh Ganesh Temple is among those very few temples in India where the deity is not worshipped as the elephant god. Want to know more about the religious places and shrines in and around the Pink City? Read our blog on the must-visit temples in Jaipur. 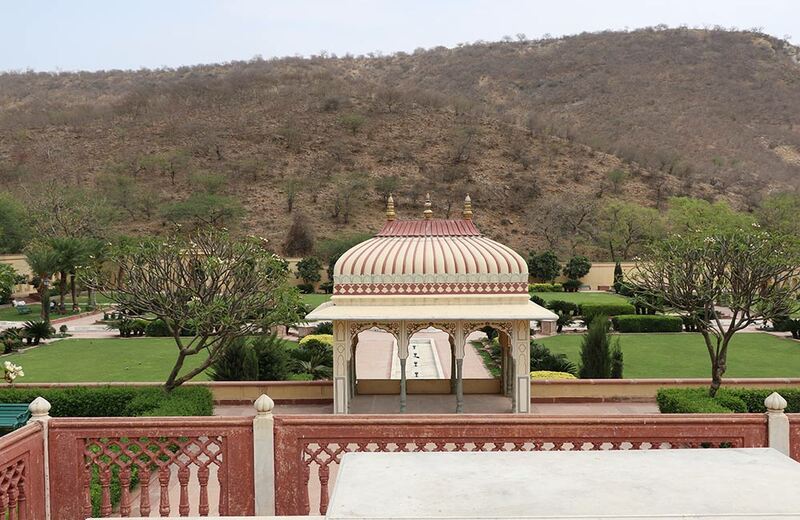 Nestled in the lap of a verdant valley on the outskirts of the city, Vidhyadhar Garden is counted among the popular tourist places to visit near Jaipur within 50 km. 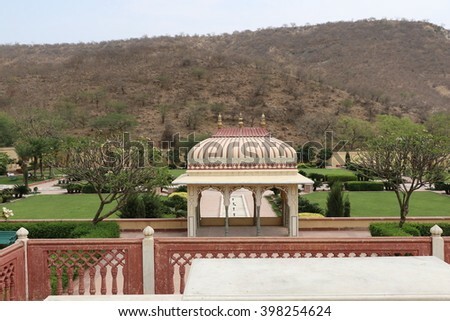 The garden is a tribute to Purohit Vidyadhar Bhattacharya, who was the planner and chief architect of Jaipur. Adorned with tranquil lakes, vibrant flower beds, well-maintained lawns, lovely fountains, and magnificent pavilions displaying paintings and murals of Lord Krishna, the garden is a serene place where you can be close to nature. It displays the perfect blend of Hindu and Mughal styles of architecture. Sisodia Rani Garden aka Sisodia Bagh is a palace garden built by Maharaja Sawai Jai Singh II in 1728 for his second wife. It is a tiered multi-level garden that boasts of spectacular fountains, exotic foliage, and splendid pavilions decorated with amazing wall paintings of Lord Krishna and his antics. The majestic double-storied Sisodia palace overlooks the garden that enhances the beauty of the place by several notches. A stroll through the garden is a visual treat in itself, something that you must not miss out on, especially if you are visiting the place with your partner. Looking for places to visit in the city with your partner? Here’s our blog on the top places to visit in Jaipur for couples to help you out. Standing in perfect contrast to the noisy expanse of Jaipur, Galta Ji is a picture of serenity. It is an ancient Hindu temple complex consisting of a series of shrines that embody architectural brilliance. Built within a narrow crevice in the Aravali Hills, the temple is a sight to behold. 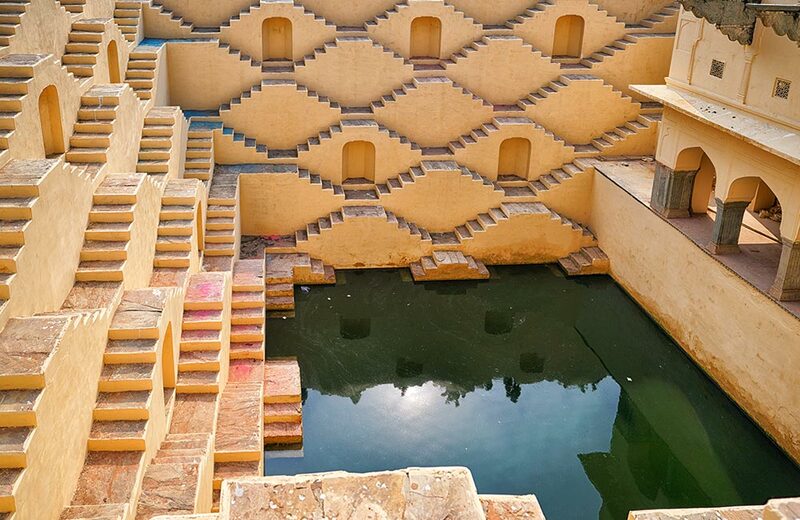 Among the main attractions of this place is the natural spring that emerges on a hill and gushes down to fill up seven sacred water tanks located within the temple complex. 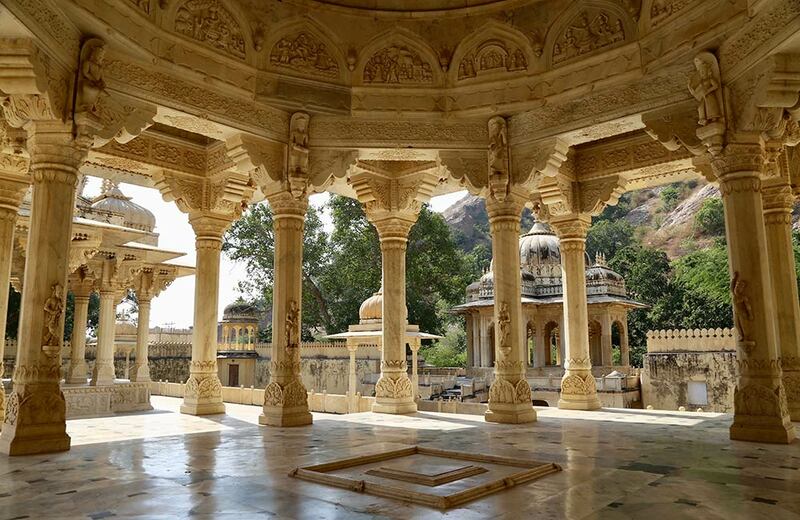 The place deserves a visit for its religious significance as well as splendid architecture and you can include it in your list of places to visit in Jaipur on a two-day trip. 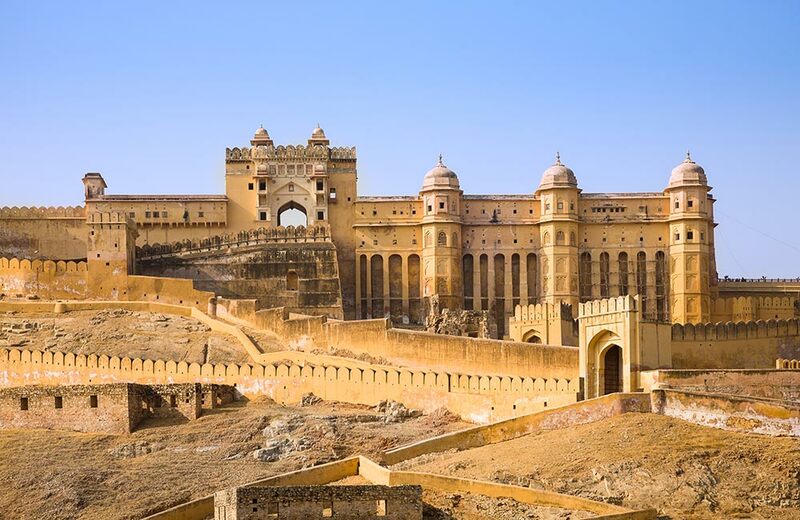 Located atop a hill, the Amer Fort stands as a testimony to the grand history and heritage of Rajasthan. This UNESCO World Heritage Site boasts of an opulent palace that is laid out on four levels, each having a courtyard of its own. 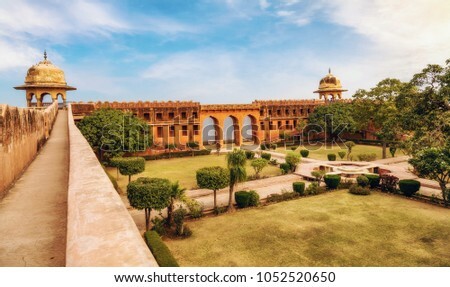 This grand palace was once the residence of the Rajput kings of Rajasthan and their families. The gorgeous Sheesh Mahal or the Mirror Palace is a part of this fort. While you are here, make it a point to attend the spectacular light and sound show held at the fort every evening. You can also shop for handicrafts and souvenirs and take an elephant ride inside the fort. No wonder, Amer Fort counts among the must-visit forts in Jaipur. Elefriend is a private elephant park that provides a host of unique experiences to the visitors. If you love these gentle beasts, this park enables you to up close with them and know in detail about their life. At this park, you can touch the elephants, feed, paint, wash, shower, and hug them. You can event paint them or take a ride on their back like royalty. Spending a day with the elephants is one experience that will stay etched in your memory forever. 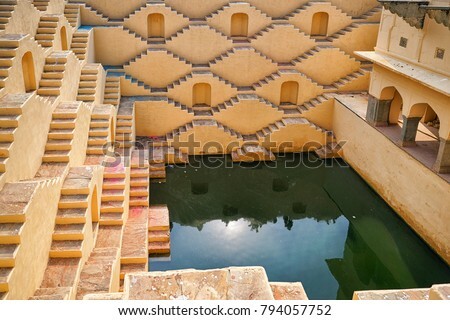 Also known as Panna Meena Baori, Panna Meena ka Kund is a stepwell dating back to another era. This ancient stepwell is still functional and boasts of being the only one in and around Jaipur to be restored. It is an eight-story step-well with an elaborate network of stairs that reach down to the water. There’s also a community space at Panna Meena ka Kund. Spend some time sitting on the steps of the well and soak in the serene ambiance of this place that has seen many turns and twists of history. Sanganer is a lovely township that celebrates art and crafts through its textile printing and handmade paper industry. Being the location of the ancient Shri Digamber Jain Temple, the place holds much attraction for the followers of Jainism as well as tourists. The red stone structure of this age-old temple boasts of immense architectural beauty. A trip to this township will allow you to explore the vibrant world of floral and block prints along with its architectural wealth. How about taking a short trip from the Pink City to a museum, a unique one at that? 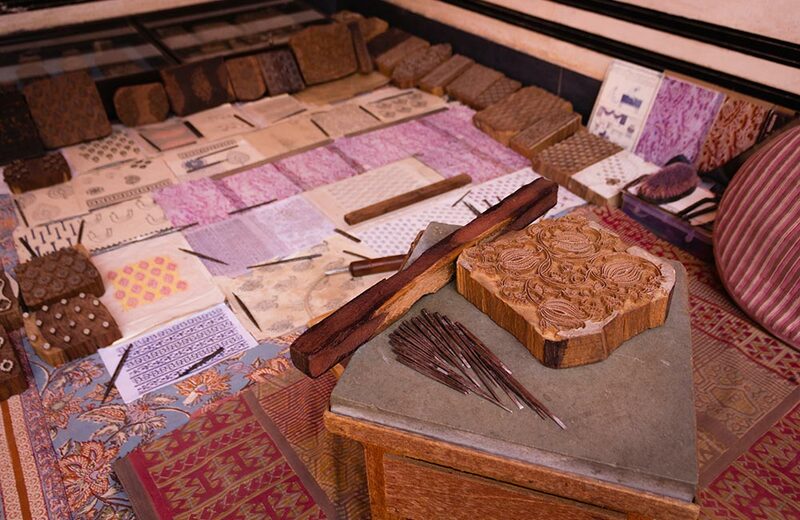 Make your way to Anokhi Museum of Hand Printing, a three-storied building dedicated to woodblock printing and hand printing. With a fine collection that includes wooden and brass blocks, clothing and home furnishings, hand printed textiles, photographs, tools, and others, the museum is a treasure trove for anyone interested in the history of textiles in the country. You can also attend live demonstrations to learn a thing or two about hand printing techniques. Interested in visiting more museums on your trip to the Pink City? Here’s our blog on the museums in Jaipur for more information. At a height of 500 feet from the sea level, the Jaigarh Fort stands with pride on Cheel Ka Tila or the Hill of Eagles. Located on a rugged terrain, the fort dates back to 1726, and was built under the command of Maharaja Jai Singh II. It overlooks the Amer Fort and offers panoramic views of the surrounding areas. Among the main attractions of the fort is a huge cannon called Jaivana, which was once the largest cannon on wheels in the whole world. You can see not just the cannon but the armory as well where it was cast. 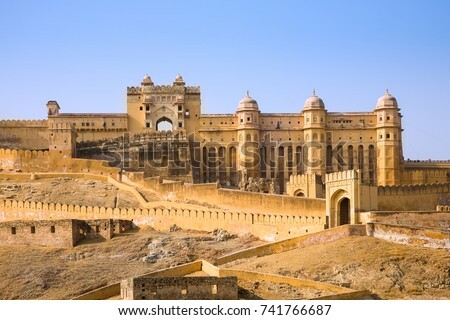 Such attractions and more make this fort one of the most popular tourist places near Jaipur within 50 km. When it comes to exciting getaways near Jaipur within 50 km, the Pink Pearl Water Park is definitely a great choice. With a plethora of water adventures and recreational activities on offer, this park welcomes you to a world of fun and excitement. From adventure rides to water slides, wave pool, and rain dance area, there is something for everyone here. Read our blog on the water parks in Jaipur to know more about the places where you can cool off this weekend. A trip to Jaipur cannot be deemed complete without a dose of Rajasthan’s cultural splendor and culinary delight, and Chokhi Dhani is one of the best places to experience both in undiluted form. One of the major tourist attractions near Jaipur within 50 km, Chokhi Dhani is a concept village that enables you to savor and celebrate the essence of Rajasthan in all its splendid glory. Walk into this place to get a true feel of rural Rajasthan, the way of life, culture, arts and crafts, costumes, and traditions. The icing on the cake is the authentic Rajasthani food served at this place. Bagru is a lovely little village located not far from the Bagru heritage fort. Considered to be one of the offbeat places to visit near Jaipur within 50 km, the village attracts travelers due to the age-old hand-printing textile industry that flourishes here. 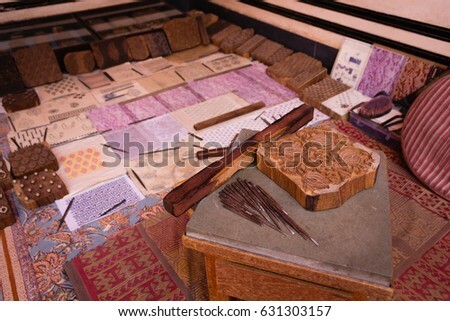 It is a treat to witness the classic wooden and block printing techniques being applied by artisans to print fabrics with the signature Bagru prints. Spend a day here learning about this vibrant craft that has managed to survive even in today’s age of technical advancement and get a first-hand experience of printing. A lavish palace turned into a heritage hotel, the Samode Palace exemplifies regal splendor and sophistication. Once a residence of the royals, it now offers a majestic experience to all those who want to enjoy a slice of royal grandeur. A day-trip to this palace allows you to witness its glorious architecture. You can even go ahead and enjoy lunch at the courtyard restaurant in the palace. A unique blend of heritage, architecture, royalty, and hospitality makes the Samode Palace one of the must-visit places near Jaipur within 50 km. These are just some of the attractions that await you around the city of Jaipur. Start exploring these and you will discover many more such hidden treasures and offbeat destinations. Till then, happy traveling in the land of Rajputanas!